When she joined the french fleet, she was first numbered F14. She has been moved to F17 around 1962, for an unknown reason so far. Perhaps for a better matching with her original sail number K17? Charles Perry reports: "...Father sold her to Dr Beppe Croce in Italy in about 1957 or 58. Dr Croce was President of the IYRU...Beppe Croce did re-name "Vision" "Manuela IV"..."
In the "Aisher questionnaire" from the early 60's, 5.5 F-17 appears quoted as being "ex Manuela"
Given the matching data on ITA 20 and GBR 17, we might have another original/alias case. Assumption: GBR 17 might have been bought by an Italian, after her silver metal in Melbourne, to become ITA 20. Anyone having historic info on both sailnumbers, please place a note here. Ownership as mentionned here on the right is the status on 1st Oct. 2004 following the Italian register (source Alberto Dollinar 28.09.07). Please feel free to add your own knowledges about original and previous owner's sequence. Vision, later becoming Virago, arrived in France in January 1964 and has been sailing in Brittany since that time. The builder was Burne's Shipyard in Bosham, Sussex, England. Arthur Robb based the design of the Daring on this successful 5.5 metre "Vision", silver medal winner at the 1956 Olympics. 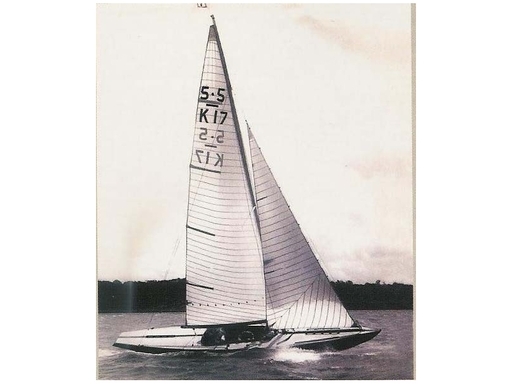 The first Daring was launched in 1960 and one year later a total of 11 boats were racing in the Solent. The local popularity of the class has grown steadily and there are now more than 30 boats, racing mainly in Cowes. She is sailing in South Brittany, in the area of Lorient, apparently since the end of the 70's. In a bad condition 3 years ago, she now has a new deck, new hull colour and is sailing again, sometimes in company of Korrigan.